New system Oracle has been updated. Equip new abilities to the skills! Inserting Runes to the Rune Page will increase the stats and activate the Oracles. 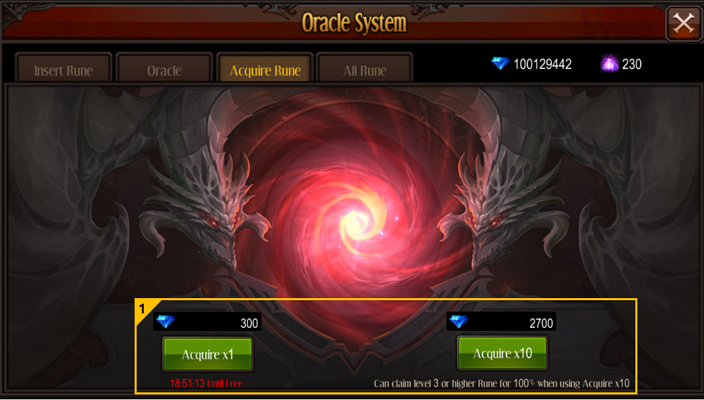 Oracle opens upon completion of the main quest [Hero's Soul] after 11 Rebirth Lv. 1. 1. Rune Types : Rune has 3 types of Peace(Defensive), Chaos(Offensive), Balance(Max Hp). 2. Insert Rune : When Runes are inserted, stats and Oracle stats can be acquired. There are 8 slots for each type of a Rune and it is gradually opened upon character's level. - 11 Rebirth Lv. 1 : 4 Slots open. - 12 Rebirth Lv. 1 : 6 Slots open. - 13 Rebirth Lv. 1 : 8 Slots open. 3. 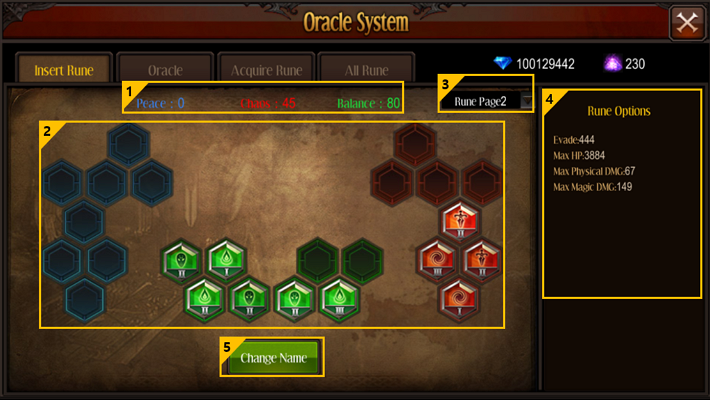 Rune Page : Possessing Runes can be inserted to the Rune Page and Oracle stats are cumulated. 2 Rune Pages are available for free, and can use Rune Pages by inserting the Runes and pressing 'Use' button. ※ 3 more Rune Pages can be purchased with unbound Diamonds. 4. 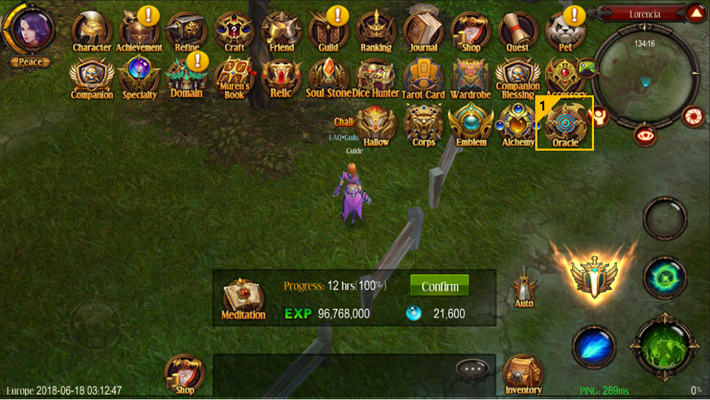 Rune Option : Can check the inserted Rune's options. The options are adjusted to the character. 1. Oracle : Oracle has 3 types of Peace(Defensive), Chaos(Offensive), Balance(Max Hp) and each type has 4 kinds, makes it 12 Oracles total. 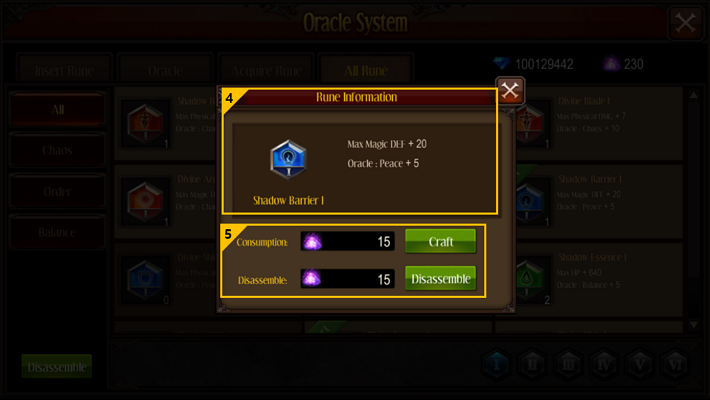 The Oracle opens when the required Oracle stats are reached. 2. 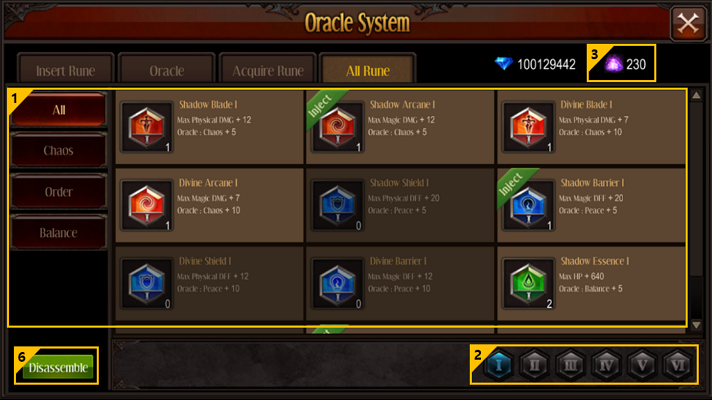 Oracle Stats : Can check the Oracle stats acquired by inserting the Runes. 3. Equip Oracle : Can equip max 3 Oracles to one of the skills. 4. 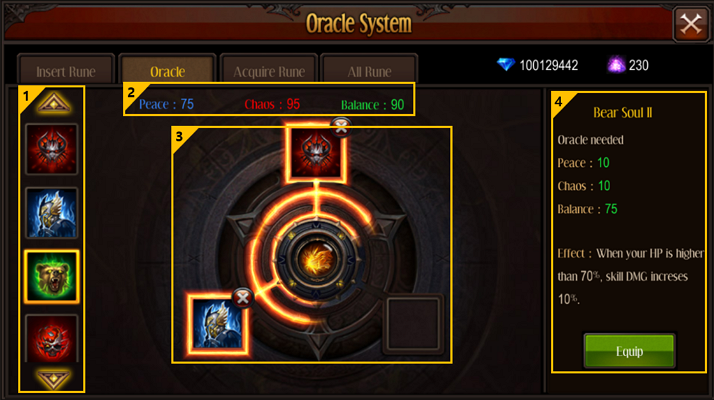 Oracle Information : Can check the required Oracle stats and the effect of the Oracle by selecting the Oracle. 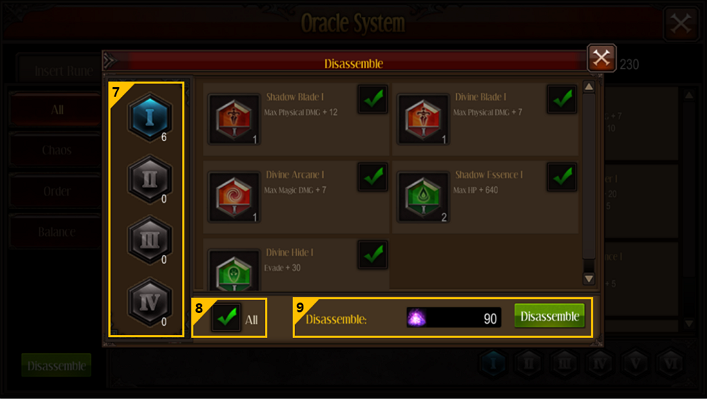 Can equip Oracle by pressing [Equip] button and the status of the Oracle will turn into equipped. 1. Acquire Runes : Can acquire Runes free for once an every 24 hours. And acquiring 1 time and 10 times by consuming unbound Diamonds are available. When acquiring 10 times, one or more Runes with level 3 or above is acquired for 100%. 1. All Rune : Can check every (possessing or not) Runes' information. When selecting the Peace, Chaos, Balance, the Runes with same types can be searched. 2. 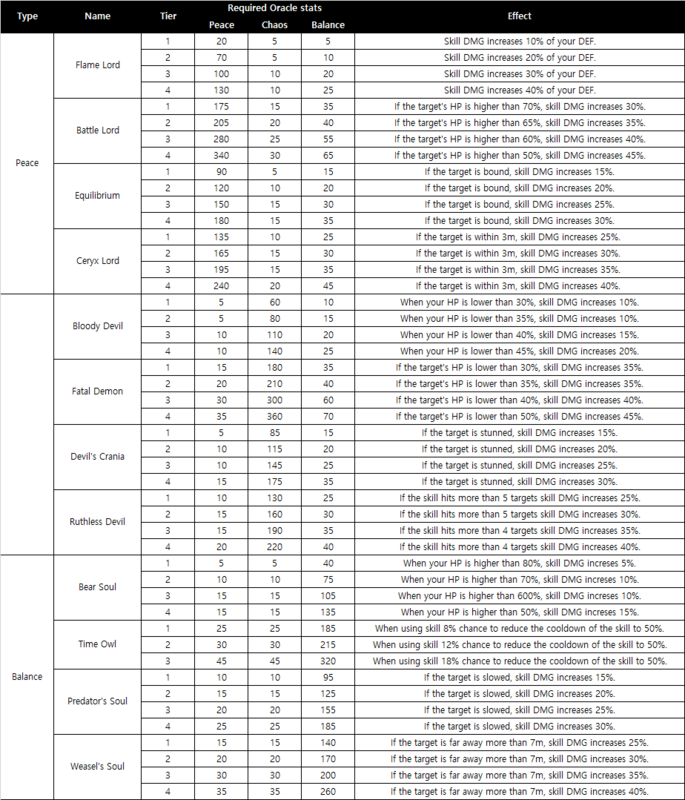 Rune Tier Search : Can search the Runes with its Tier(1~6 Tier). 3. Possessing Rune Dust : Can check the amount of possessing Rune Dust. ※ Rune Dust can be acquired by disassembling the Runes. 4. Rune Information : When selecting Runes in All Rune section, corresponding Rune's name, effect, Oracle stats can be checked. 5. Rune Craft & Disassemble : Can craft or disassemble the Runes and the possessing Rune Dusts can be checked. ※ Can acquire Rune Dusts by disassembling the possessing Runes. With Rune Dusts high Tier Runes can be crafted. 6. Quick Disassemble : Can disassemble the possessing Runes easily. 7. Rune Tier : Can check 1~4 Tier Runes by pressing the corresponding Tier. 8. All : Can check Runes individually when [All] button is checked off. 9. Disassemble : Can check the amount of acquired Rune Dusts when disassembling. When the [Disassemble] button is clicked Runes with the set conditions will be disassembled. ※ Once the Rune has disassembled, it can't be reversed. So be careful.